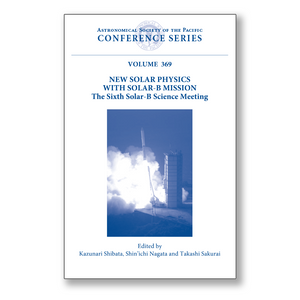 These proceedings of an international conference held 8-11 November 2005 in Kyoto provide a comprehensive overview of the science and possible observing programs of the Solar-B mission, whose main goals are to identify the coronal heating mechanism and to investigate magnetohydrodynamic processess occurring in the solar atmosphere such as magnetic reconnection. The Solar-B satellite was successfully launched on 23 September 2006 (JST) by ISAS/JAXA, and has been renamed Hinode (sunrise in Japanese). The Solar-B mission is the third japanese Solar physics satellite project following Hinotori and Yohkoh, and involves significant multilateral international collaboration with NASA (USA), PPARC (UK), and ESA. The aim of the conference was to discuss basic scientific objectives, possible observing proposals and programs of the Solar-B mission. This conference was the sixth in the series of Solar-B science meetings. The conference consisted of 12 sessions: Instrumentation, Convection and Dynamo, Magnetism of Quiet Sun and Active Regions, Waves and Shocks, Chromospheric Heating, Coronal Heating, Local Helioseismology, Emerging Flux, Reconnection Flares, Coronal Mass Ejections, and Solar Wind, thus covering almost all fields of solar physics. There were 19 invited reviews, 18 contributed talks, and 73 poster papers presented on these topics. The book is suitable for researchers and graduate students interested in solar physics and related fields, such as astrophysics, space plasma physics, magnetospheric physics, laboratory plasma physics, and magnetohydrodynamics.